Nidek's Excimer Laser EC-5000 is designed to reshape the cornea for PRK and LASIK. One of the first lasers to gain FDA approval in the United States, the EC-5000 features an innovative scanning technology that provides a smooth, uniform treatment surface. This is a vast improvement over earlier lasers that left ridges or grooves that could distort vision. This system is designed to perform treatments over a large area, allowing vision correction procedures for patients with large pupils. It is FDA-approved to treat mild to high degrees of nearsightedness with and without astigmatism. During the LASIK procedure, the EC-5000 monitors system parameters continuously, ensuring proper treatment. 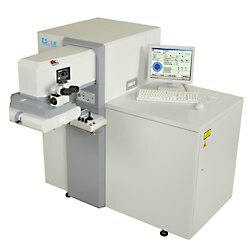 The NIDEK EC-5000 Excimer Laser System has been approved for use in the United States to perform laser in-situ keratomileusis (LASIK) for the correction of myopia ranging from -1.00 D to -14.00 D MRSE with or without less than or equal to -4.00 D astigmatism; in patients who are over 21 years of age; and in patients with documentation of stable manifest refraction as defined in the indications statement over the past year. If you are interested in LASIK to reduce their dependence on lenses, or eyeglasses, our doctors can determined If you are a LASIK candidate.